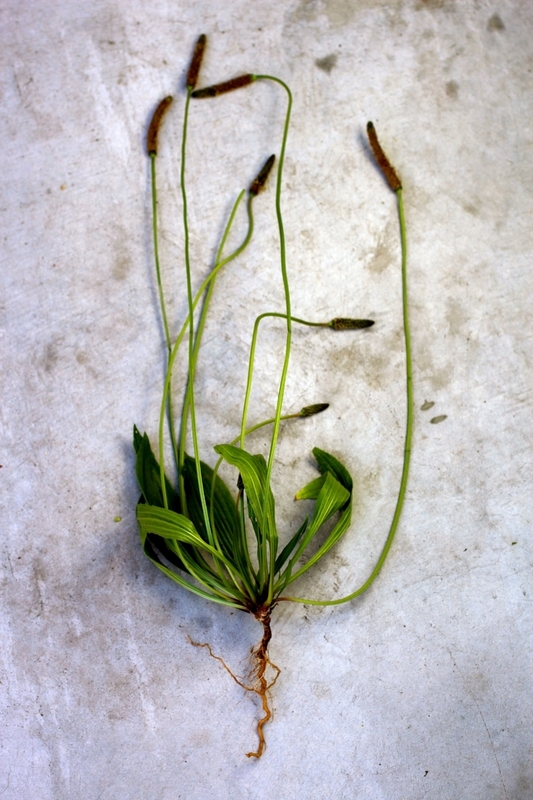 Entire Plantago lanceolata, complete with leaves, seedpods and roots. Plantain (Plantago major and Plantago lanceolata) is easy to recognize and grows everywhere. You probably have some growing within a block of where you are RIGHT. NOW. Plantago major is the plantain with the wider, oval-shaped leaves and Plantago lanceolata is the plantain with the thinner leaves (lance-shaped, as the name indicates). I will save explanation of of the plantain in general and using the leaves for another post (in short: the leaves can be eaten as you would other greens, ideally cooked, as they are quite fibrous) and focus this post on the late-spring/summer/early fall delicacy - plantain seed pods. When I was young we used to catapult the brown seedpods by wrapping the stem around the pod and flinging it. This is an enjoyable activity to this day, BUT maybe instead of flinging the pods at your sister (ahem - you know who you are! ), fling them into a pan with some butter and thyme to prepare this simple, delicious recipe. Alternatively, just cut or pull off the pod stems away from the plant. Plantago seedpods are as great for eating as they are for flinging! When I first heard that these seedpods tasted like morel mushrooms I didn't think it was possible, but I was wrong - it is. I promise - give it a try and you will see. The other great thing about these pods is that they are packed with psyllium, a form of fiber that is often added to foods to increase dietary fiber content, as well as calcium. Yes, that's right - grow everywhere, taste like morel mushrooms AND high in nutrients. The pods can also be broken up into smaller seeds and toasted in a pan with herbs and spices to sprinkle on top of salads/popcorn/etc. or eat as a snack. This method of preparing plantago seeds is very simple, so there is no excuse not to try! Sautéing seedpods in cast-iron. At this point, they have soaked up all of the butter/oil and if I need to cook them longer I would have to add more. Heat butter and/or olive oil (enough to coat bottom of pan) in a cast-iron pan on medium-high. Add seedpods (with or without stems, I like to include the stems to use for serving) and heat for 2 minutes, tossing to coat in butter/oil. Add thyme and a sprinkle of salt and continue cooking another 1-2 minutes, stirring occasionally until pods are toasted and seeds just begin to fall off. If seedpods look to dry, add more butter or oil and toss to coat. Serve immediately. If stems are still attached, they can be used as a serving stick (eat just the pod off of the stem - the stem is very tough).